Under the Comprehensive Stormwater Management Enhancement Amendment Act of 2008, effective July 1, 2009, it is illegal to sell, use, or permit the use of coal tar pavement products in the District of Columbia. Violators of this ban are subject to a daily fine of up to $2,500. The Government of the District of Columbia issued this ban to protect human health and our environment. Coal tar pavement products contain high concentrations of polycyclic aromatic hydrocarbons (PAHs), a suspected carcinogen and highly toxic chemical with known harmful impacts on humans and animals. Concentrations of toxic PAHs in coal tar pavement products are about 1,000 times higher than in alternative asphalt-based products. Coal tar pavement products are usually used as sealants on parking lots and driveways. In a 2004 study, U.S. Fish and Wildlife Service researchers linked PAHs to liver and skin tumors in as many as 2/3 of brown bullhead catfish in the Anacostia River. Rainwater washes toxic, PAH-containing sealant particles and dust down storm drains and into our local streams and rivers, threatening aquatic life in the Anacostia and Potomac Rivers and the Chesapeake Bay. A 2010 study showed that dust from coal-tar-sealed parking lots contained 530 times more PAHs than dust from parking lots with other surface types. DEMAND the use of a much less toxic asphalt-based sealer instead of coal-tar-based products. Don’t allow a mixed product containing both coal tar and asphalt to be used. For new projects, consider using porous concrete. Homeowners may DISPOSE of unused sealant products at District Household Hazardous Waste Disposal site. Recently sealed parking lots appear to have a dark black sheen. Although it is not possible to visually distinguish between pavements sealed with asphalt products versus coal tar sealant products, if you smell coal-tar-based products and notice that the pavement has a glossy shine to it, please alert DOEE below via our tip line. If you suspect that a business is in violation of the District's Ban on Coal Tar Pavement Products, please fill out the Coal Tar Tip form, or give us a call at 202-645-6988. You may also want to read the Coal Tar Post Card. There are good alternatives to coal-tar-based pavement sealants. Asphalt-based pavement sealers dominate use in the western US; coal-tar-based pavement sealers dominate use in the central and eastern US. Dust from coal-tar sealed parking lots contains about 8 times more toxic PAHs than undiluted used motor oil. PAHs are toxic to mammals (including humans), birds, fish, amphibians and invertebrates. For more information please contact Lillian Power ([email protected] or (202-671-0080). 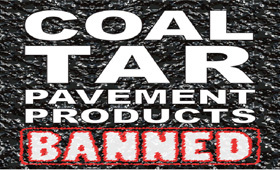 The Department of Energy and Environment requires violators of the coal tar ban to remediate. One approved remediation option is removal via shot blasting. Shot blast machines use steel shot to pulverize the top layer of the surface, forming a dust. This dust is sucked into the machine using a vacuum equipped with a HEPA filter. The dust collects in the back of the machine. As of September 2014, DOEE has ordered the remediation of 13 sites contaminated with coal tar pavement sealant, totaling 436,271 square feet. All sites have been successfully remediated. The remediated sealant from these 13 sites contained the same amount of PAHs as approximately 600,000 gallons of undiluted used motor oil, the third most concentrated source of PAHs in the urban environment.